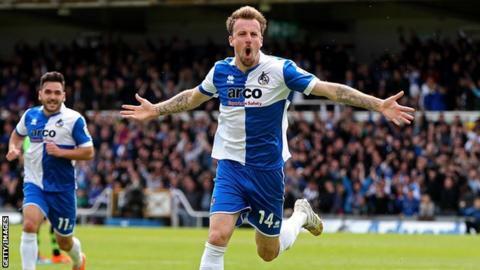 Bristol Rovers beat Forest Green to secure a 3-0 aggregate victory and book their spot in the Conference promotion final at Wembley later this month. Already ahead thanks to Matty Taylor's goal in the first leg, Rovers booked a tie with Grimsby on 17 May. Chris Lines fired the home side in front before half-time, converting Taylor's low cross. Forest Green pressed after the break but Taylor's smart finish in the closing stages put the tie to bed. Bristol Rovers, who finished second in the Conference table, one point behind champions Barnet, are now 90 minutes away from an immediate return to the Football League. Having come down from League Two on the final day of last season, they will hope to become the first team in 10 years to bounce straight back up after relegation. Forest Green, meanwhile, were competing in the Conference play-offs for the first time having recorded their best-ever finish of fifth, but the Pirates' class told over the two matches. "I'm proud of my lads, over the two legs I thought we were the better team. "Ady's done a fantastic job at Forest Green, so I'm really pleased to be through. "But I must stress that we're going to Wembley to try and do the business, try and get promotion out of the league, so there won't be too many pats on the back. We'll enjoy it for the next couple of days but after that it's back to business. "The final's going to be a tough game, but you've got to be in it to win it. We're not going there for a day out and we'll be giving it everything." "Fantastic season - I don't want anybody to be disappointed at all. "The two games they (Bristol Rovers) deserved it, end of, but we've had a fantastic season and I think everybody should be very proud of what they've done. "I just thought they were the better team, both games, so you've got to put your hand up and give them the credit they deserve. "We've got to take on board what we've done this year and look forward to next year - we'll get there, we've had a really good season and we'll take it on the chin and move on." Match ends, Bristol Rovers 2, Forest Green Rovers 0. Second Half ends, Bristol Rovers 2, Forest Green Rovers 0. Attempt missed. Andy Monkhouse (Bristol Rovers) right footed shot from outside the box is too high. Substitution, Bristol Rovers. Angelo Balanta replaces Matty Taylor. Goal! Bristol Rovers 2, Forest Green Rovers 0. Matty Taylor (Bristol Rovers) right footed shot from the right side of the six yard box to the bottom right corner. Assisted by Lee Brown with a cross. Substitution, Bristol Rovers. Ollie Clarke replaces Lee Mansell. Attempt saved. Lee Mansell (Bristol Rovers) right footed shot from the right side of the box is saved. Attempt saved. Andy Monkhouse (Bristol Rovers) right footed shot from outside the box is saved. Attempt missed. Chris Lines (Bristol Rovers) right footed shot from outside the box is too high from a direct free kick. Attempt blocked. James Jennings (Forest Green Rovers) right footed shot from the centre of the box is blocked. Attempt blocked. Rob Sinclair (Forest Green Rovers) right footed shot from the left side of the box is blocked. Substitution, Forest Green Rovers. Charlie Clough replaces Daniel Coles. Attempt saved. Jake Gosling (Bristol Rovers) left footed shot from outside the box is saved. Substitution, Forest Green Rovers. James Norwood replaces Elliott Frear. Attempt saved. Matty Taylor (Bristol Rovers) right footed shot from the right side of the box is saved. Attempt missed. Matty Taylor (Bristol Rovers) right footed shot from the right side of the six yard box misses to the left.